Are metallic epoxy REFLECTOR™ floors for you? Metallic epoxy REFLECTOR™ flooring is growing in popularity for its beautiful effects. It has deep, rich mottled colours. We can create various looks using different colours and techniques to give you a durable floor that is unique to your project. 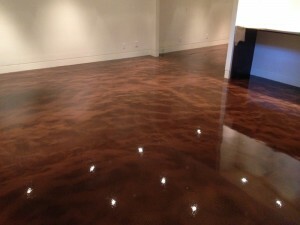 Metallic epoxy floors fit in any application. Metallic epoxy floors are fluid-applied and poured in place, fast set for quicker turnaround time. They are completely self-levelling, ultra-durable and unique. Compared to other types of floor coverings, the cost effectiveness just cannot be beat. Most metallic epoxy floors are less colourful than those portrayed in the images below. There are unlimited colour options, combinations and visual patterns/textures and this flooring system can have gloss or satin finishes. Special colours can match design or preferred colours making each epoxy floor an original reflection of your home or business. Metallic epoxy REFLECTOR™ floors continue to be popular choices for commercial, industrial and residential applications, popular amongst property owners, architects and specifiers. 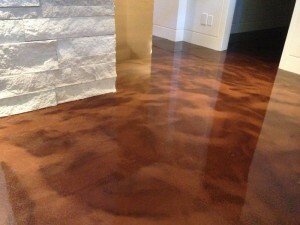 To learn more about metallic epoxies call Hardscapes for more details at 403-547-5597. We’d love to help you bring your floors to life! « Time for a garage floor facelift this winter?